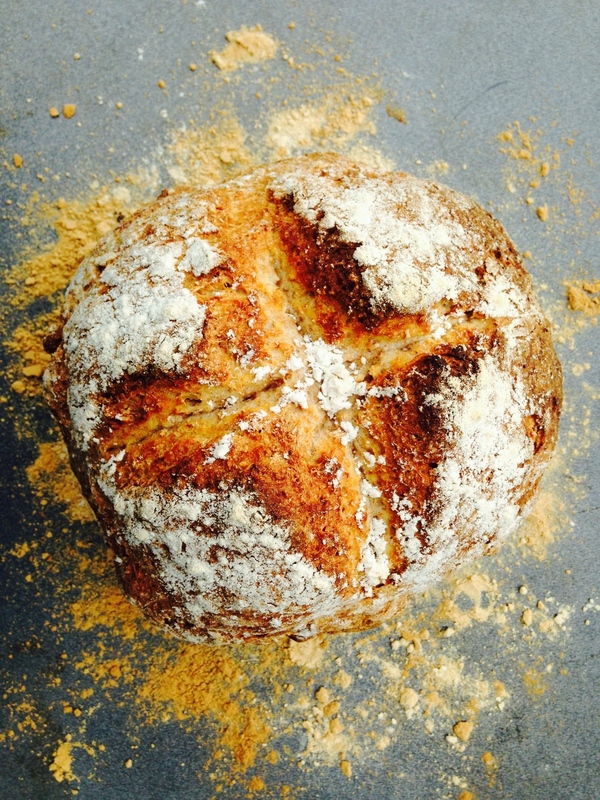 Soda bread has to be on my list of top five comfort foods. It reminds me of my granny in Ireland, lovely big slabs of it for tea with jam or Calvita cheese on it. Nowadays I like it with butter you can see your teethmarks in or slathered with jam (or both). It doesn't require proving and it freezes well. Also it is said putting a cross in the top of it lets the devil out! Preheat oven to 230°C/Fan 210°C/Gas Mark 8. Sieve the dry ingredients into a large mixing bowl. Sieve again to give plenty of aeration. Make a well in the centre and add the buttermilk. Using a wooden spoon mix the ingredients together, work quickly as the buttermilk has already started reacting with the bicarbonate of soda. Turn out onto a lightly floured surface and knead lightly into a round loaf shape, do not overdo this as the bread with be tough, just enough to shape it. Place onto a floured baking tray and cut a cross in the top with a floured knife. Place in the middle of the oven and bake for 30-40 minutes. When baked the bread will sound hollow when tapped on the bottom. Wrap in a clean tea towel and allow to cool. This stops the crust from hardening too much, it will already be quite crusty.